As we begin to open our heart with the intention of wanting to take better care of ourselves, we start and sometimes unknowingly, to invite new people, captivating situations and interesting circumstances into our life. When this happens old thoughts and programming will creep up, this kind of energy can be very draining and often wears us down. Negative thoughts will mess with our intuition and we can often get confused. We might ask ourselves the question, ‘which voice do I listen to’? 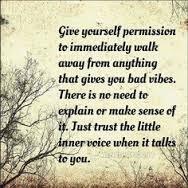 How do I know when it is my intuitive nature speaking and directing me and when do I recognize that it is just my Ego with all of it’s fears and worry thoughts trying to tell me what to do? This is a very good question, and one that has a simple answer. When our intuitive nature whispers to us, there is no emotional or reactive reaction to what the message is, at first. When the message comes to us from our gut feeling, there is no emotional attachment to it. When we are in the present and we are centred and focused, we are usually calm. This space is a place of non emotion. This is the space we need in which to really listen for the guidance we so often ask for, from above. When we are in a state of ‘dwelling’, then we know our Ego has a hold of us. It loves to drag us back to the past, but more so, it’s deepest desire is to make the present seem like the worse doom and gloom. Our mind will play tricks on us in the most intelligent ways. Our Ego has a clever and brilliant way of turning conditions and the context of our life around using the most confusing methods. Worry, fear, anguish, dread, these are usually the emotions that are attached to our Ego thoughts. All the while with one motive only, and that is to attack our self-esteem, our self-worth and our self-confidence. Why would the Ego do that to us? Because our Ego, the conditioned part of our brain hates the thought that anything in our life, the way it is now, would change. Change represents the Soul, personal growth, the evolution of ‘ourself’, and most of all, our Soul constitutes the entitlement of ‘truth’. Rest be sured, the Ego speaks far, far from any of the truth of who we are. We are not what we hear inside of our head. We are a divine human being, with a Soul that tells the story of who we are. This is the voice you can trust, those gut feelings, those little whispers that come as messages, the voice of reason and your very best friend, ever.